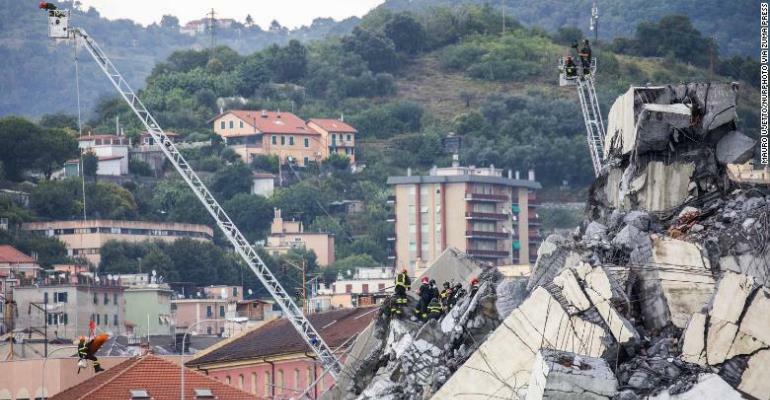 Finding Fault and Faulty Infrastructure: Genoa’s Morandi Bridge Disaster - Integration Through Media ....! Bridges are the great symbols of human connection. They suggest a certain animal pride in the human race, a technological capacity to trick, and even subordinate nature. Across ravines, rivers and bodies of space, the bridge suggests the raising and linking of the miraculous, a suspension that facilitates contact and speed. They also suggest power, triumph, and continuity. Little wonder then, that such disasters as the collapse of the Morandi Bridge in Genoa on August 14 cripple pride and shock the senses. On this occasion, nature was not going to be tricked. A storm did its work, and duly brought down a 100 metre section of the viaduct, inaugurated in 1967, with ferociously lethal consequences. Decades of maintenance had failed to stem the fall, and 35 cars and heavier vehicles plummeted some 45 metres below. This beast of Italian structural engineering was gone. But the broader picture was hard to ignore: creaking infrastructure is back on the cards, and various agents are being viewed as catalysts. Interior Minister Matteo Salvini has issued an irate order to the company to pay 500 million euros to assist the families and local government. In a move that suggests that the horse has all too readily bolted, the Ministry of Infrastructure will be given more intrusive powers of monitoring and inspection and compel motorway operators to shift more profits from their enterprise towards safety and maintenance. A number of the grieving families of the dead showed little interest in participating in a state funeral duly run in the hall in Genoa on Saturday. They have pointed fingers in fury at state authorities who have all too readily divested their obligations on safety, favouring the good graces of the private sector. “It is the state who has provoked this; let them show their faces, the parade of politicians is shameful,” came the remarks of one aggrieved mother, whose views of resigned fury were noted in La Stampa. Where there is crisis, there are those willing to speculate and exploit. Crisis breeds chances and prospects. Large dollops of blame are being handed out to a range of players, much of it done with calculated effect. More reactionary elements of the British press, ever keen to suggest traces of primitive provincialism in Italy, suggested that the mafia might have had a hand in it, notably in its link to using an inferior form of cement known as “cemento depotenziato”. No hard evidence has been adduced on that specific connection in the Genoa disaster, but that hardly stops speculation from flapping its wings. The EU budget commissioner, Günther Oettinger, dismissed Salvini’s remarks as being “very human”, which was another way of claiming he was being erringly foolish. “It is very human to look for somebody to blame,” he tweeted with dripping condescension, in the face of such disasters. Nor could the EU be accused of being miserly on the issue of funding. It had already forked out some 2.5 billion euros to fund Italian roads and trains for the current budgetary cycle. The shoe, came the implication, was actually on the other foot. Indigenous factors had come into play. Italy needed to ensure that infrastructure such as motorways needed to be monitored and inspected on a regular basis. Neither Salvini nor his populist ally Luigi Di Maio of the Five Star Movement, have much time for such paperwork niceties. A point worth noting here is that the Five Star Movement citizen’s committee in Genoa had declared, in an April 2013 release, that any potential collapse of the Morandi bridge was the stuff of fairy tales. For them, the EU looms like a chiding, despotic behemoth, dictating budgetary rules of prudence that have duly sacrificed efforts to keep Italian infrastructure in good hands. On the home front, the Italian government will be facing a bind. Autostrade is hardly going out of pocket, nor will it do so without a fight. Cancellation of the license will result in compensation – some 20 billion euros is one estimate. Where infrastructure fails, death might ensue, but money payments will always follow. In the meantime, the problems of funding ailing infrastructure will continue to give the government profound headaches. The battle over irresponsibility will continue to be fought.